Google search engine provides millions of search results each day. We use it for different reasons like education purpose, official purpose or for entertainment. But do our search results are effective enough? We all already know about google voice search, google image search, google video search and other easy searching methods in the google search bar. Most of the time we just use the simple method for google search because most of us aren't technology geek. There are some following advanced google search tips that will change the way you search. This google search guide is simple and worth learning. May be some of you guys know some google search tricks as well. Now it's time to learn some more, so that you can use google search engine more effectively. You can also learn some keyboard tricks to do it wisely. When we normally search for google then google provides some guesswork for each search. 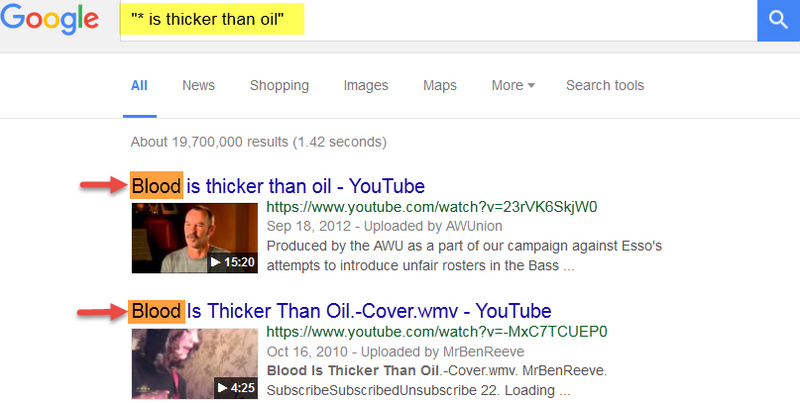 If you use quotes then it tells google to be more specific about the phrases. For example you want to search for cheap golf stick then google will search around this phrase and you will find huge search results(34,00,00) but if you quote the search like “cheap golf sticks” then the result will be more specific. I found only twelve results but with exact same phrase and exact order I have searched for. Look at the picture closely. This will remove any google search suggestions that have the word "car" in it. You may notice that when you search anything on google then google uses your regional google site like google.com.au or google.com.uk. But you may want to search on google with No Country Redirection by the following method. Then search anything you need in the search bar. 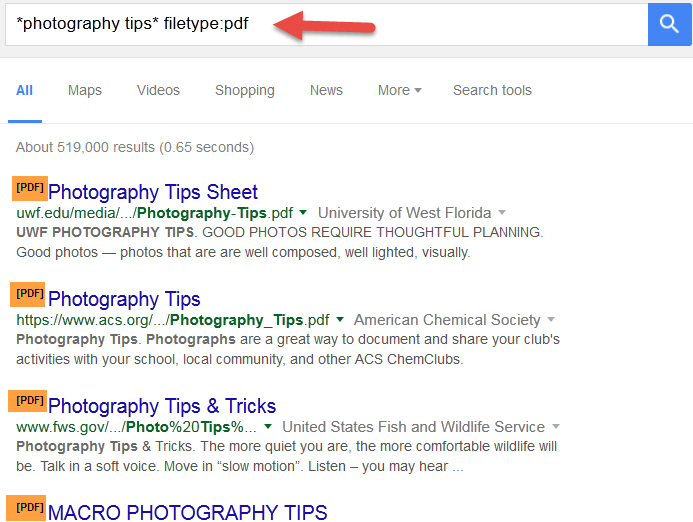 You can avoid local marketer's attraction on your search results by adding "ncr" at the end. There are several google search tabs in the top of every search result like Web Search, Image Search, Video Search, Google People Search, News Search and more options. Most of us already use these tabs but if you don't then I recommend you to do that. With these search tabs you can define the type of search you need to. If you need just image then go to image option or if you need videos then click on the video tab. Sometimes you need to search for a specific website. You need a content or article and you need to limit search suggestions only to a single website. This search will let you find if there any content about “How to block a website” but only on www.trickytechtunes.blogspot.com. All similar contents from other websites will be disappeared. If you want anything on a particular website then use this trick. If you want to find a movie in a specific torrent website then you can use this trick. Sometimes you need to find the middle part of a name or you are trying to remember a song by lyrics because you forgot the whole phrase then you can use this trick. *You can search for a song > "Flying with the guys * Crying like last night"
If you search for all forms of an expression then you can search this way. Google will try to suggest you results that mention something is beautiful than flower. Something was used instead of other words like life,men or she. It's simple. If you want a definition of a word by dictionary then just search this way. Let's think you have a favorite gaming website and if you be able to find some similar sites then you will be happy to explore more. You may read all the contents of the website and you need a new similar one. This tips is very useful and I'm sure if you already know the trick then you used it many times before. I'm going to share this tips if you missed that one. In the google search you will not find IGN, You will find some other gaming sites instead. you can use this powerful tips for educational search, blog sites or anything you might interested in. 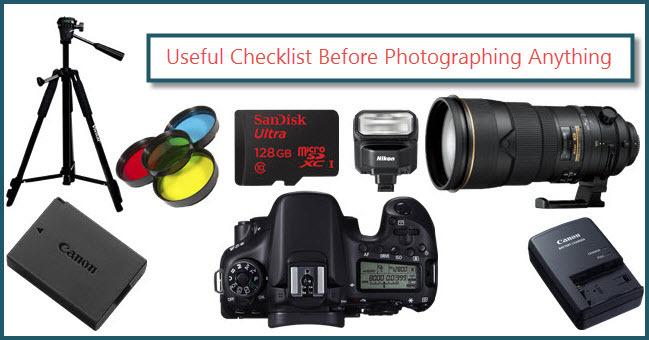 Let's say you are looking for some books related to photography tips then this method is going to be the most important tips for you. May be you are searching for a specific book, journal or anything related and you want it in pdf format or as document file then just use this method. Replace your words in the *your keywords here* filed and search for any file type like pdf, xlsx or docx. This is very helpful for researchers, students and for presentation purpose. If you're a student then you may need it frequently. 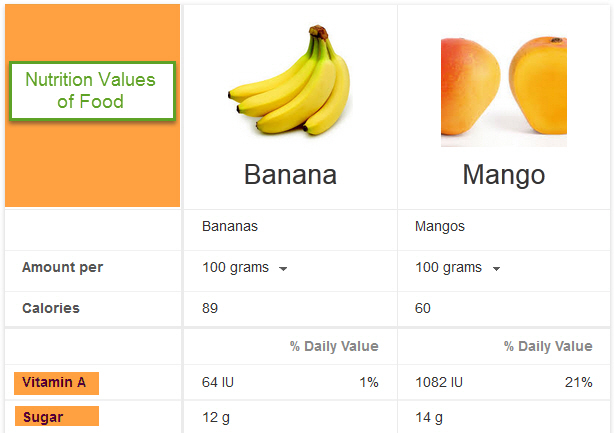 You can also solve your daily simple math with simple google search. You don't have to pick a calculator or you don't have to open calculator window from your application from all programs. You can solve the math in the google search bar. You will find the result in the google search result page. You will also find a calculator and use it for other mathematical purpose. You may notice here I capitalized the word “OR”. This simple trick is really very useful. Normally when you search anything on google then google will suggest you all the terms and related keywords under its niche. Like if you search for milk or water then you'll find all the results associated with these words. But if you search this way “milk OR water” then you'll find more specific suggestions having only milk or only water related websites. My favorite football team is FC Barcelona, yours may be different one. Anyway search for your favorite team like “FC Barcelona” in the google, then google will use google sports and show you if any match in progress or updated score or schedule. If you have to know the sunset time or sunrise time of your local region or any other region then you may use this trick. Just google in this way “sunset Budapest” or “sunrise Budapest” and get the answer. By this trick you can search for a word in title, url or in a page body. Suppose you search for a word and you want this word should be in every suggested title of the google search result. Then search this way, “intitle: google search”, and if you want these words in the url then search for “inurl: google search”. “intitle: google search” To search the word in title. “inurl: google search” To search the word in url. “intext: google search” To search the word in body of the page. 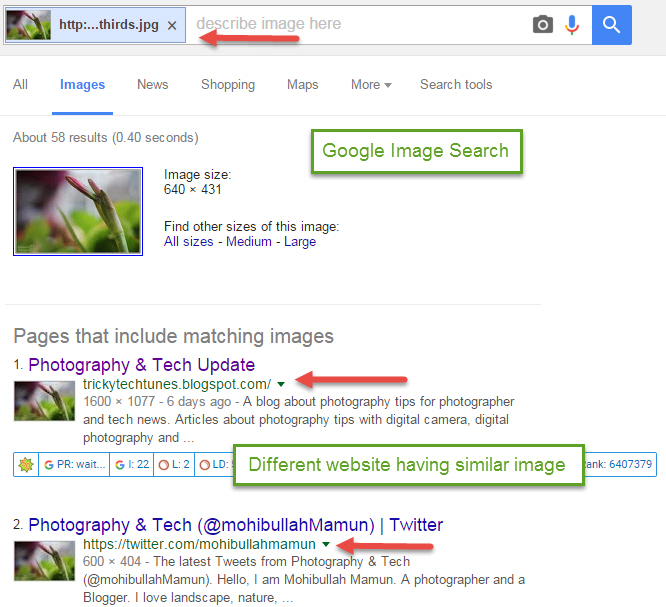 If you are using Chrome as your web browser then you have the option to google image search by image. Simply right click on any image and click search google for image. You will find any kind of similar images in the result. You can use this method for finding duplicate image or other websites that have the same image file. Google chrome also has the default option for search google by image. In default google search page at the top you will find “images”. Click on that and you'll find a camera option in the google search bar. You can either paste an image url or upload an image and then hit the “Search By Image" button. Google search engine is the best search engine among search engines. You can use this advanced google search tips for your daily life use. You can also use google custom search or google safe search if you want to be more specific or if you want to limit your google search result. Google image search, google people search and google voice search is also useful. If you use Internet Explorer as your browser then you can use google toolbar to get the most of google. Very useful tips to use Google search engine in an effective way. Thank you for these google search tips. Very unique article and a wonderful topic. Love it. Thank you. Happy to share my favorite google search tips and tricks. This google search tips actually works a lot. Google is huge and you have to tell google exactly what you are asking for. Very useful google search tips. Normally we just type our keywords in the google search bar. Thanks for the pro tips, will use this search tips next time. Have a nice day. Thank you. This is the best google search tips list I have ever found. Very interesting topic. Your web design is so so beautiful i like your web page design you wrote a good article i learn your website best search engine i have no word to describe your web.